"Avatar" continues to do well at the box office in its sixth weekend in release. 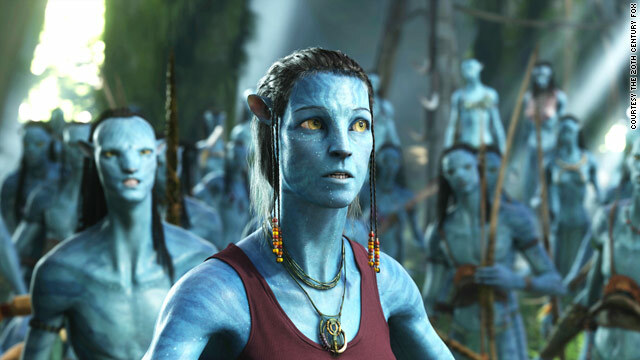 The earnings have now climbed to $552.8 million domestically and is on track to top "Titanic"
(Entertainment Weekly) -- Nothing can stop the reign of "Avatar." A scant 16-percent drop in its sixth weekend of release has helped James Cameron's sci-fi spectacle become the second highest-grossing movie of all time. In contrast, the new releases failed to make a significant mark, with the apocalyptic film Legion performing strongest with an estimated $18.2 million and a second-place showing. Avatar earned an additional $36 million this weekend, climbing to $552.8 million domestically and surpassing "The Dark Knight's" $533.3 million domestic haul. If it continues to drop in the 20-percent range as it has the last few weekends this time it only fell 16 percent it's on track to is top Titanic's $600.8 million by mid-February. Worldwide, Avatar is also the second-highest grossing movie of all time at $1.8 billion, trailing "Titanic" by less than $7 million. In contrast, none of the new releases is likely to have much of an afterlife. "Legion" may have bowed in second place, but it earned a dismal C- from exit pollster Cinemascore, meaning there is unlikely to be much positive word-of-mouth for this movie. Twentieth Century Fox's "The Tooth Fairy," scored better with audiences (it's Cinemascore is an A-) but with a $14.5 million gross and a fourth place debut that portends an inauspicious future for this family-friendly comedy starring Dwayne Johnson. And then there is "Extraordinary Measures." This debut film from nascent studio CBS Film didn't connect with audiences. Earning only $7 million for a three-day frame, the Harrison Ford/Brendan Fraser medical weepie landed in seventh place and will likely be out of the top 10 by next weekend when the Disney comedy "When in Rome" opens opposite Mel Gibson's R-rated revenge drama "Edge of Darkness." For second week holdovers, "The Book of Eli" and "The Lovely Bones" both performed strongly. "Eli" dropped 48 percent to land in third place with $17 million. It's total cume stands at $62 million. "The Lovely Bones" also dropped 48 percent, bringing its total gross to $32 million. The rest of the top ten included "Sherlock Holmes," grossing an additional $7.1 million for a sixth slot, and "Alvin and the Chipmunks: The Squeakquel" earning $6.5 million for eighth place.